Product prices and availability are accurate as of 2019-04-22 03:00:51 EDT and are subject to change. Any price and availability information displayed on http://www.amazon.com/ at the time of purchase will apply to the purchase of this product. 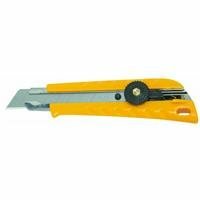 Professional strength stainless steel blade channel secures blade for the toughest of cutting jobs. Blade is made of high-quality Japanese grade carbon steel and designed for unparalleled sharpness and superior edge retention. Long lasting and durable - a new sharp edge with just a snap. Easy, tool-free blade change. Great for cutting paper, cardboard, roofing, drywall, vinyl, acetates, etc.